Rød pølse (plural - røde pølser) is a bright-red, most often boiled pork sausage very common in Denmark. 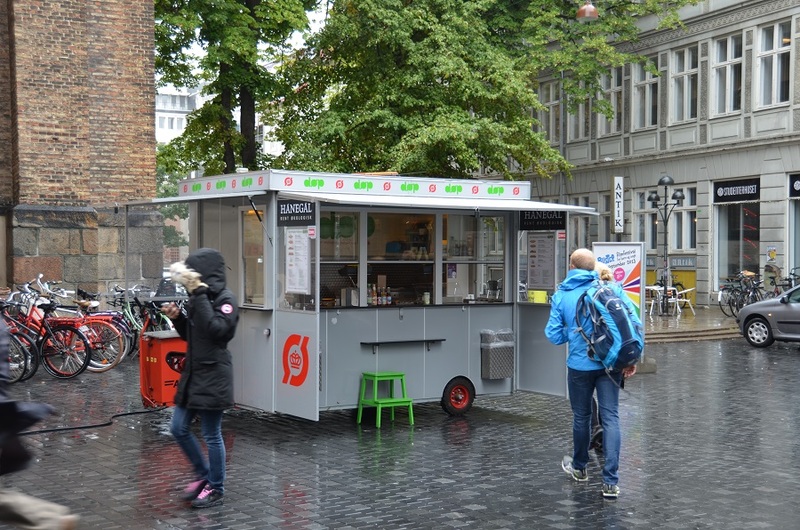 Hot dog stands selling the familiar sausages are common in Denmark and many regard the rød pølse as one of Denmark’s National dishes. Røde pølser are a Vienna-type sausage; the filling being finely ground like American hot dogs and having a similar texture. They are longer and thinner than their American counterparts and still have their casings intact. They are traditionally dyed red with carmine. I understand that may be a hold-over from times past, before refrigeration, as an indication the sausages were not freshly made that day. From the street vendors they can be grilled but they are most often cooked in hot water. The traditional condiments are personal choice combinations of: remoulade, mustard, ketchup, fried and fresh onions and another specialty, pickled sliced cucumber. 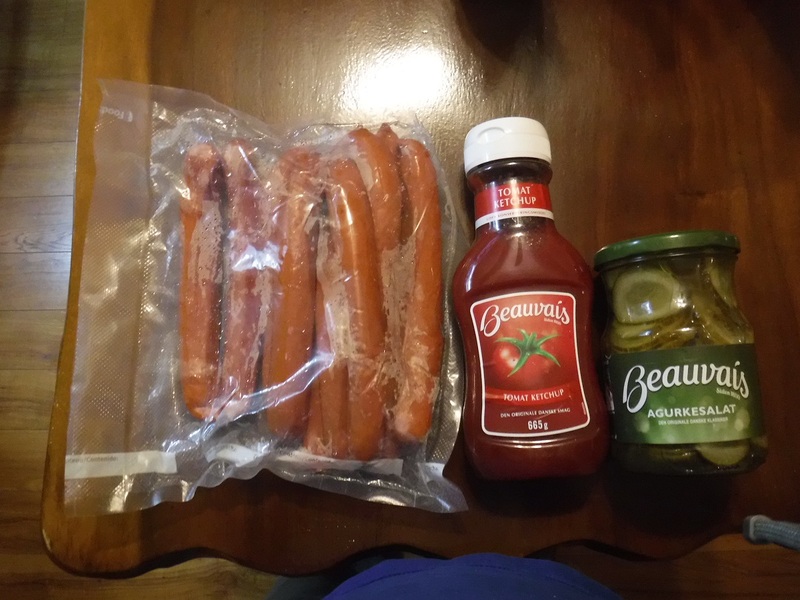 If I were in Scandinavia, my list of ingredients might look like this: røde pølser or grillpølser sausages (sold in 5-packs), buns (also sold in 5-packs), remoulade sauce, spicy mustard, ketchup, fried onions, a white onion and agurkesalat (Danish sandwich pickles). Such items are not easy to come by in the United States. An Internet search finds only a handful of importers or local small scale private production you may wish to try. In the meantime the following list of ingredients is of similar domestic products and easy make-at-home condiments. 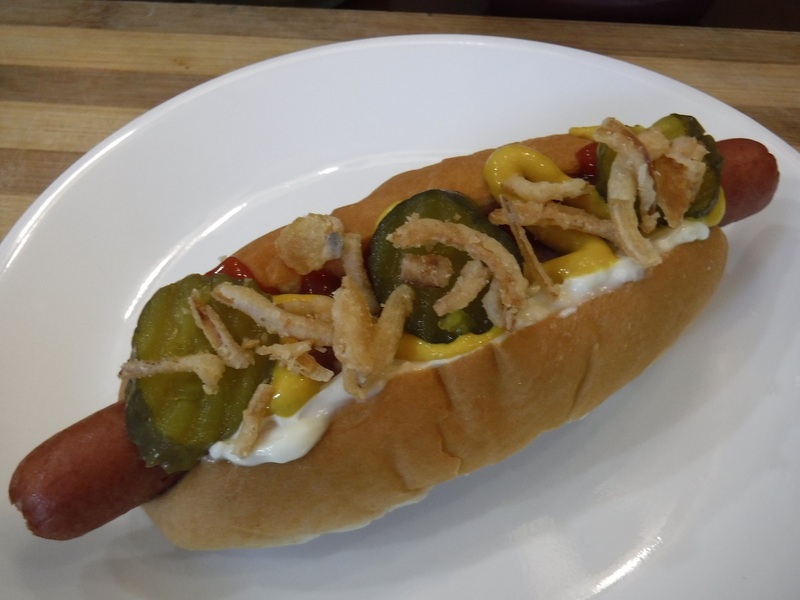 Try your hand at making this famous Danish hot dog. Røde pølser and similar sausages are fresh sausages; they have not been brined, smoked or cooked. They need to be thoroughly cooked before eating. To cook: heat water to boiling in a large saucepan. Add the rød pølse and simmer - gently boil for about five minutes. Too fast or hard a boil will rupture the skins. You can grill if your wish (grillpølser); it will add color and eye appeal and some extra flavor from the grill. Cooking from scratch on the grill will usually result in burst pølser. It is best to par-cook in water as above and then grill the pølser just enough to add the color and grill marks. 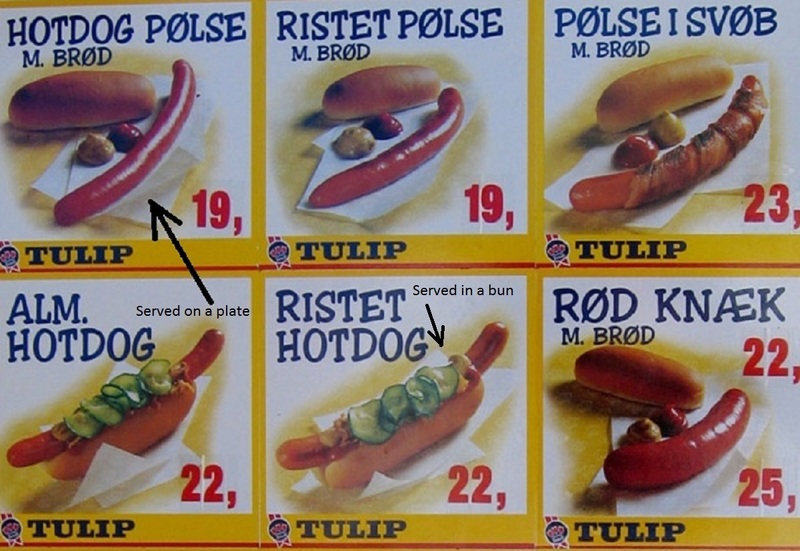 If you are ordering you rød pølse from a Pølsevogn, a street-corner stand, you can have it served on a plate with dabs of condiments and a bun on the side, med brod (with bread). We are going to go with the hot dog in a bun. A lot goes into the bun. Heat or steam the bun so it is pliable and won’t split. Te traditional condiments are: remoulade (a spied up mayonnaise), spicy mustard, Danish-style ketchup (a bit sweeter than the US variety), agurkesalat (Danish sandwich pickles), onions (fresh chopped or crispy fried). 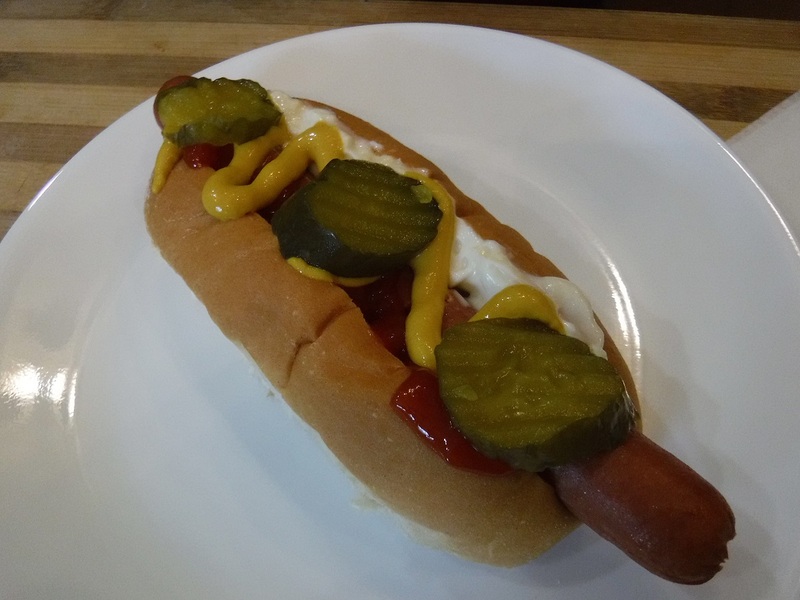 Traditionally there would be a slathering of remoulade on the open bun, add the hot dog and add a stripe of mustard on one side and a stripe of ketchup on the other. Sprinkle with some onions and top with lots of slices of agurkesalat. That would closely emulate a Danish street-corner hot dog. Personal preference does come into play. Of course add more of what you like and leave off what you don’t. Do try one and enjoy the slightly smoky flavor of a rød pølse if you can find them and savor the flavor or Merry Old Copenhagen. You can always give it a squirt of your favorite hot sauce too. On a recent visit together, my sister, Pattie Sue and I did a bit of heritage exploration in the kitchen. We prepared some foods that are somewhat unique to Denmark and followed the footsteps of our paternal grandfather, Andrew, whom we only know from some short encounters when we were very small children. Although Grandfather Andrew left Denmark with his parents and siblings perhaps thirty years before Røde pølser were common on the streets of Copenhagen we did enjoy out tastings of our ethnic food and it helped to bring a bit of our history closer to home. We hope that you also enjoyed the journey as well.